It was a good birding year. Many sad and unfortunate things occurred in 2016, but the birding was good. I started the year in Florida, traveled to India with the ABA in February, combined family and birding in an August trip to California, and in-between saw very good birds in New York and New Jersey. The year list total is 709 countable and 2 non-countable birds. I like to add, “But I’m not a lister!” But, of course, I am. I try not to go crazy and have passed up opportunities to just go for ‘the tick’; those chases usually don’t end well for me anyway. There is satisfaction in seeing well-loved migrants again, familiar birds in unfamiliar places, and, of course, Life Birds, each beautiful or exceptional in its own way. Here are my 10 Best Birds of the Year, listed in chronological order, except when they’re not. If you haven’t read the 10 Best lists of my 10,000 Birds compadres, you may also want to read about Corey’s birding achievements, Pat’s envy-inducing Costa Rica list, Tom’s Ten Best, featuring his beautiful photographs, and Clare’s wonderful British Top Ten. We all have our individual criteria for what makes a Top Ten Bird of the Year. 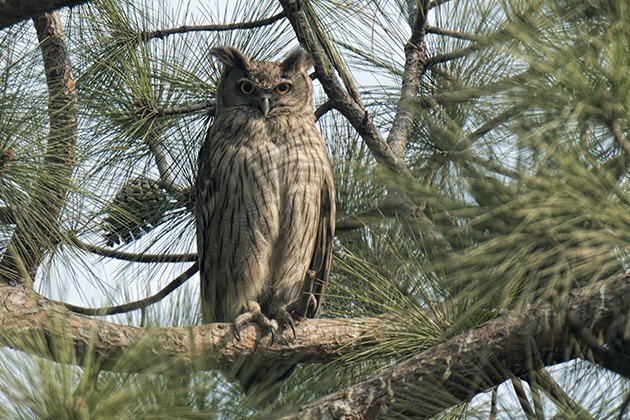 (1) Dusky Eagle-Owl. There’s a lot of good birding to be done at the Taj Mahal: Rose-Ringed Parakeets and Red-vented Bulbuls on the grounds; Painted Storks and Pied Avocets along the Yumana River, seen from the Taj terrace; Booted Eagles and Black Kites flying overhead. But the best was when we were gathering at the gatehouse to leave (many of us still taking Taj selfies) and a sister birder casually asked if I’d seen the Dusky Eagle-Owl. What? Where? The answer was right in front of me, a bit to the right, an adult keeping an eye on oblivious tourists, the nest deep within the tree. 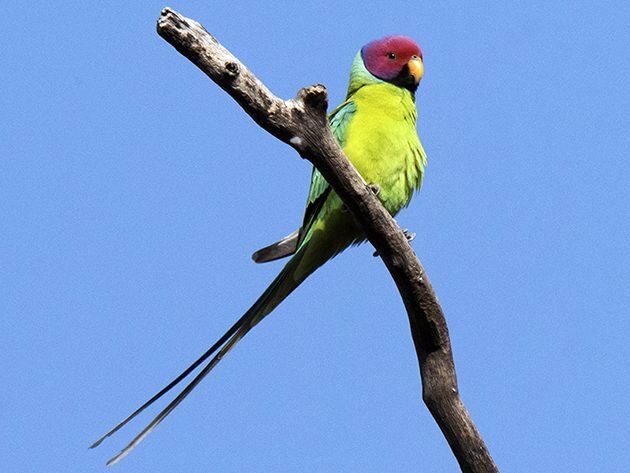 (2) Plum-headed Parakeet. 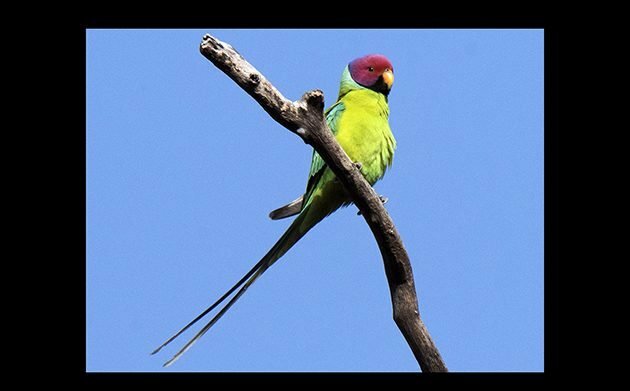 I was thrilled to see many of these gorgeous birds at the fort at Ranthambore NP, India. Poor Adam Riley, the leader of this particular day trip, which was devoted to photography; he had a lot of trouble getting us back into the vehicle! This is a male bird, of course. The females are also beautiful, but in a more subtle way, with bluish-grayish heads. (3) Greater Adjutant. I think this might be my best bird of 2016. Greater Adjutants are huge birds that were once widespread across much of Southeast Asia; today there are two small breeding populations in India and Cambodia. 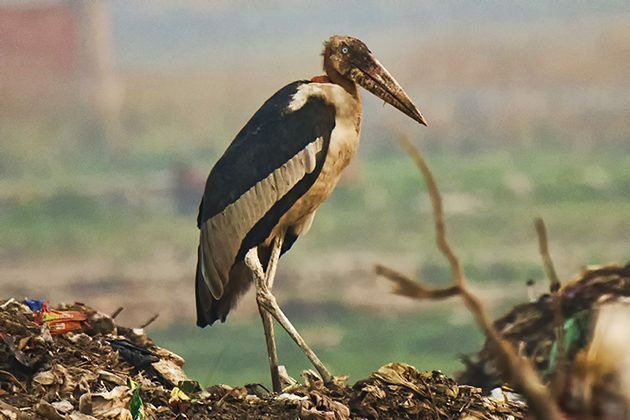 I saw this Greater Adjutant in Assam, India, where they scavenge in the Guwahati city dump. There were several there, plus Lesser Adjutants. There is no experience comparable to birding a dump, and, I have to say, I have never experienced a dump like this one. Seeing this giant, awkward yet majestic bird walk through the densely littered landscape was a surreal experience. (4) Small Pratincole. 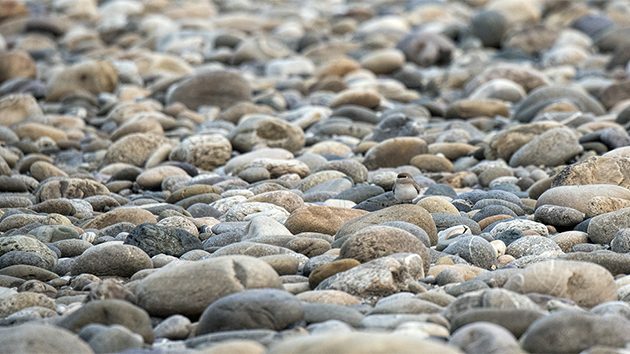 Small Pratincoles remind me of Piping Plovers—tiny, infinitely cute, and possessing fantastic camouflage, in this case the rocks of the shore of the Jia Bharali River, one of the borders of Nameri National Park (Assam, India). I love the compactness of these birds and their subtle shades of white, gray, and brown plumage. Their call is distinct, and it was fun watching them fly and call over the rocks and then seemingly disappear when they landed. Can you find the Small Pratincole? (5) White-winged Duck. White-winged Duck is an ugly duck, maybe the ugliest bird I’ve ever encountered. 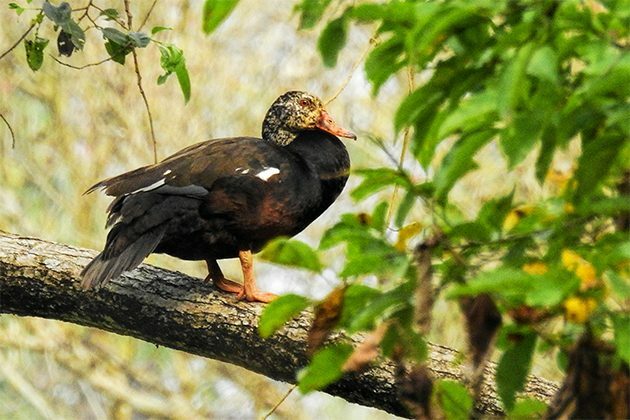 It is also one of the rarest birds I’ve seen, part of a decreasing, fragmented population of less than a thousand individuals, 300 of which are estimated to live secretively in the swampy forest ponds of Nameri National Park, India. We hiked over two miles to see this bird, and as we approached the pond, our guide warned us to be very, very quiet. We went in through the thick vegetation surrounding the pond one-by-one, took photos of the duck roosting in a tree across the pond, and then hiked out as quietly as we could to make room for the next birder. Once we had all seen the duck, we gathered and whispered, reluctant to leave, wondering if whispering was necessary because the creature seemed indifferent to our presence. Finally, deciding that a duck that required 250 acres of land to breed probably did not welcome intruders, we tiptoed out of the swamp. I did bring home an unintentional souvenir, a leech in my sock. Only a small one, my Rockjumper guide reassured me, an initiation to real Southeast Asia birding. (6) Garganey. A Garganey showed up in Ohio in 2011 and I had a chance to chase it and I didn’t. Don’t ask why, it had something to do with putting people before birds. The decision haunted me. So, when a Garganey showed up in Montezuma Wetlands, N.Y., that eternal question—to chase or not to chase—was easily answered. 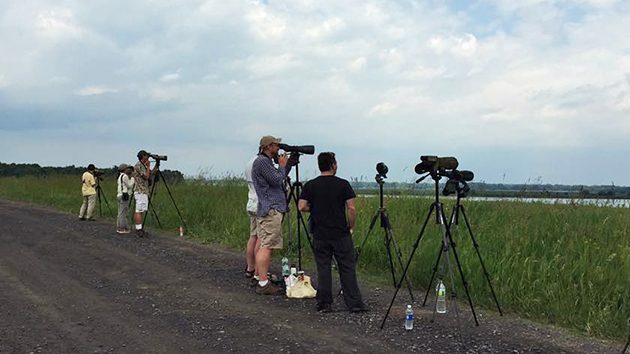 I drove up with friend Ian Resnick (who likes to drive), and when we got there we saw a line of birders scoping. And, scoping. Sometimes snacking. Eventually, Anthony Collerton spotted the duck far off, swimming in and out of the reeds, all field marks visible. This was an ABA bird for me; I had already seen it in India, but I was thrilled to finally observe it in the United States. Like Corey, I was not able to get a photo of the Garganey, so I present to you a rare image of 10,000 Birds co-owners Mike and Corey birding together. (7) Piping Plover. I observe Piping Plovers every summer and they are amongst my favorite species overall, both because of their cuteness quotient and their ability to survive (with a little help from Plover monitors like my friend Laura, who convince beach goers that having dunes fenced off is not destroying their summer). It’s on this year’s list because I finally got a photograph of a baby Piping Plover, one of the items on my photographic bucket list. I was at Nickerson Beach, Long Island, on my belly photographing baby Common Terns when I saw a bit of movement, almost like a piece of sand moving, out of the corner of my eye. This is what I saw. (8) South Polar Skua. After avoiding pelagic birding for many years, I decided it was time to go to sea again. Armed with Dramamine and ginger and gray elastic wristbands, I embarked on an August pelagic from Half-Moon Bay, California with Alvaro Jaramillo and a Field Guides group. It was somewhere after the Cassin’s Auklets and before the Black-footed Albatrosses that I realized I was doomed to be seasick no matter how many meds and ginger chews I ingest (and, no, the patch doesn’t work either). Of all the excellent seabirds and gulls I somehow still managed to see on that journey, the one that stands out the most is South Polar Skua, which flew into view just as my seasickness was at its worst. But, I saw the bird! I even managed to get a single photo, sorta. 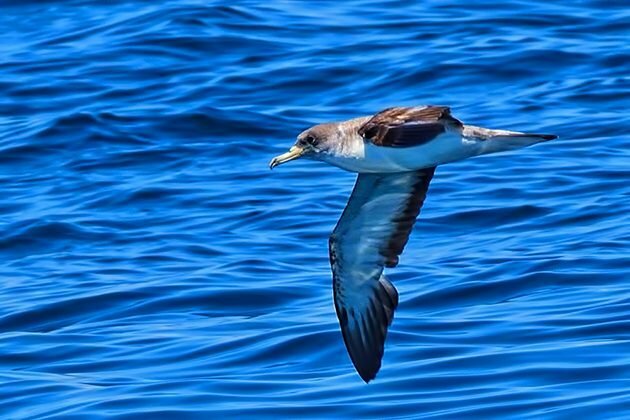 (9) Cory’s Shearwater. I tested the waters before my California pelagic, with a brief Atlantic Ocean voyage, a whale watching trip from Montauk, N.Y. with members of the Queens County Bird Club. 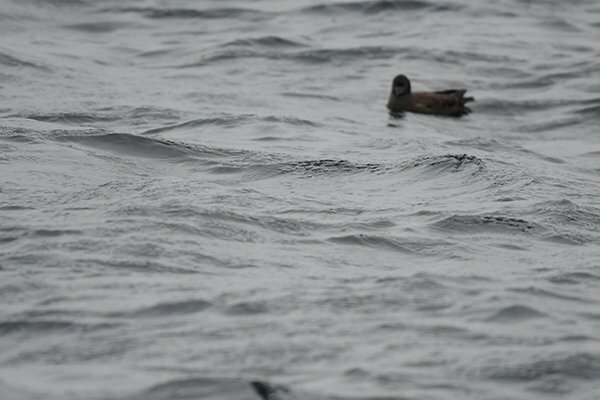 Maybe it was the good breakfast, maybe it was the larger boat, but the seasickness was minimal and I finally got to see Cory’s Shearwater, a seabird which had eluded me from land for years. The Cory’s was one of my birding goals of 2016, one of the last commonly seen birds of the East Coast needed for my ABA list. 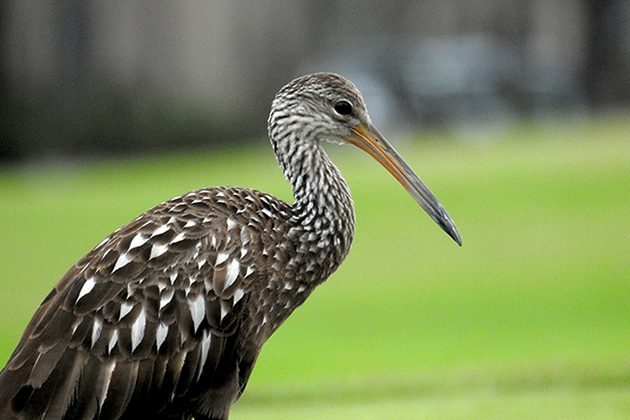 (10) Limpkin. My 10th best bird of the year is here because it was part of a birding excursion led by my pre-teenage nephews, Jake and Zach. They are not birders (yet), but they’ve learned to keep an eye on what they see around their Florida neighborhood. On this particular trip to their secret local bird spots, we saw 27 species in 36 minutes, including Burrowing Owl, Wood Stork, Monk Parakeet, and this Limpkin, photographed by Zach. I’m looking forward to what Jake and Zach will be showing me in a few weeks. Bring on 2017! Congratulations on an amazing year of birding, Donna! We’re looking forward to seeing how you top this in 2017. Hi Donna, Glad you were able to really get out there last year. I’m not trying to rain on your parade. But the photo between the cute Piping Plover chick and the Cory;s Shearwater is Not a South Polar Skua. That is a Black-footed Albatross. Perhaps the seasickness has lingering effects… 😉 Just teasing. Enjoy the New Year. Thanks for the sharp eye, Tim. That was one of the many Albatrosses I saw on the trip, and it was probably the lingering effects of seasickness. Never goes away, I still squirm when I go to Montauk. I’ve swapped the photo out for the skua. Seasickness also gives one great photographic skills. An incredible year of birding Donna! And what fantastic photos to go with it. I love the way raptors stare back at us as we watch them. The orange eyes of the Dusky Eagle Owl really penetrate. 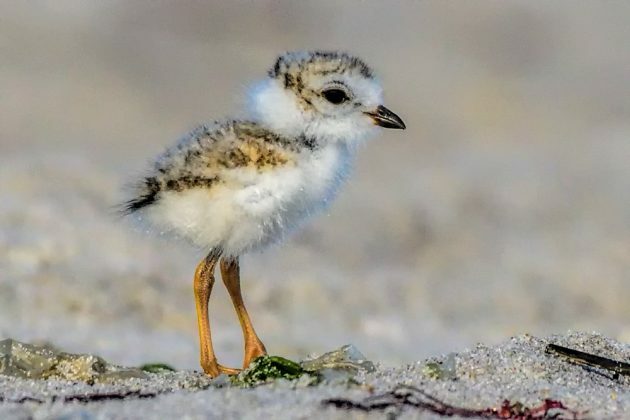 All of your top ten birds are amazing to me but the one that really stands out for me is the Piping Plover chick. The cuteness factor is off the charts and your superior camera angle is, well, prostrate. Great shot! Thanks so much, Larry. Yes, I was in a most fortunate position when I saw that Piping Plover chick, swiveled on my stomach to catch it. Serendipity. 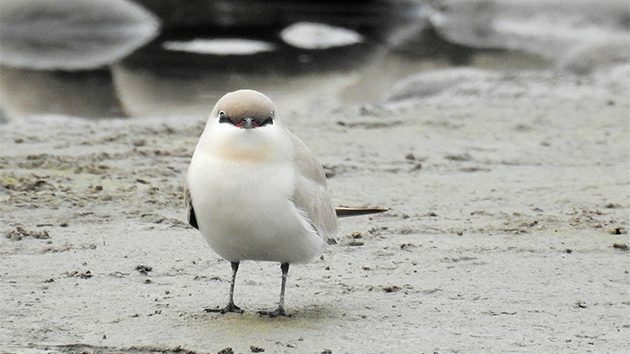 Congrats on a great year of birding, your top ten is just as envy-inducing! What a great top 10! Have fun with your nephews in Florida! Holy cow! How close to that duck did you get?! ?